"The Greatest Story Ever Told" by Fulton Oursler sold millions of copies and continues to inform us about the life of Jesus Christ. The cover illustrated by Feodor Rimsky became the visual image of Christ accepted by the publishers and embraced by many as one of the most outstanding and provocative portrayals of Jesus ever created. The original artwork was kept by the artist's family for years but now it has been rescued from obscurity, and reproduced in a state of the art print now available to the public. The print made from the original art work created for the cover of "The Greatest Story Ever Told" by Fulton Oursler, is reproduced on archival watercolor paper. The reproduction of Christ's portrait was supervised by the artist's son and comes with a certificate of authentication as 1 of 1000 limited prints. Each picture of Jesus is stamped, dated, numbered and signed by the Artist's son and the portrait of Christ clearly shows the artist's original signature. The print comes with a document including a family history of the artist, the creation of Christ's portrait as well as images of the book cover pictured above and information about "The Greatest Story Ever Told" by Fulton Oursler. 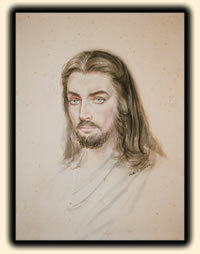 Photo image of the original painting of Christ's portrait, painted by Feodor Rimsky for the book cover of "The Greatest Story Ever Told" by Fulton Oursler. The actual print for sale can be seen on the Gallery page. Shopping Cart is not engaged yet, sorry.